617 Living is a collaboration by Nicole Blanchard and Daniel O'Leary. As friends and colleagues since 2011, they specialize in condo sales and apartment rentals in the Boston real estate market. 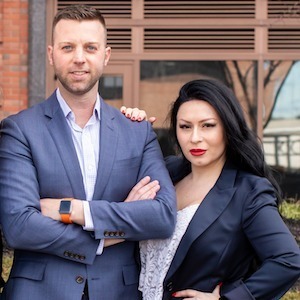 With extensive backgrounds in sales, customer service and hospitality, Nicole and Daniel have ambition and integrity at their core. 617 Living strives to deliver a seamless, stress free experience to their clients offering not only real estate -- but a lifestyle. Since 2015, 617 Living has been the top producing rental team in the State of Massachusetts. THE LUCAS | ONE BEDROOM PLUS DEN -- An historic German Trinity Catholic Church transformed into condominiums. This condo is pet-friendly and features original architectural elements complemented by modern conveniences and ample closet and storage space. Complete with SmartHome technology, a Nest Thermostat, Sonos connectivity throughout, gas fireplace, central cooling/heating, and washer dryer in the unit. A sleek kitchen hosts a breakfast bar along with top of the line, full-sized appliances, touch faucet, and gas cooking. The bathroom offers dual vanities and a soaking tub. The Lucas is the perfect blend of a full-service living and an intimate environment. On-site amenities include concierge services, a fitness center, resident's lounge and terrace. Located moments from Whole Foods, yoga and spin studios, fantastic eateries and the Red and Orange Lines for the T. Easy access to I93, I90 and Logan Airport. LOVEJOY WHARF | Brand new, luxury homes on the North End Waterfront. From the designer kitchens, to the exceptionally well laid out floor plans, these modern condominiums are ideal for the luxury urban experience. Life at Lovejoy is enhanced by hospitality-style services including The Lovejoy Wharf Luxury Attachè which offers access to lifestyle services such as travel, dining, nightlife and entertainment. Additional amenities include a health and wellness space, manicured rooftop terrace with grills and ocean views plus a clubroom and conference room. Residents are greeted by 24 hour concierge and doorman. Parking options are available. Lovejoy Wharf recently welcomed Alcove -- an onsite restaurant by Tom Schlesinger-Guidelli. Lovejoy Wharf is conveniently located moments from MGH, Converse, the Boston Public Market, Gov't Center and North Station. This location is a city-dweller's dream! BROKER FEE PAID BY LANDLORD -- It's here: the ultimate residential experience. Luxurious apartments with world class amenities are waiting for you! Every apartment home offers oversized windows with hardwood flooring throughout and high ceilings. Stylish kitchens feature quartz countertops, GE stainless steel appliances, and a sleek backsplash. Designer bathrooms emphasize modern style with sleek finishes plus laundry in unit. Relax on a private terrace or enjoy the rooftop social lounge with panoramic city views boasting a heated swimming pool, cabanas and movie theater. Work out in the sprawling fitness center with yoga and spin studio -- or let your inner-chef embrace the grills in the courtyard! This pet-friendly community has your paws covered with a self-service pet spa, and outdoor dog run! Moments to Financial District, Boston Common, the historic North End and MGH with 24 hour concierge. Welcome home, to the lifestyle you've been waiting for! THE HARLO LOFTS | BROKER FEE PAID BY LANDLORD -- Unique residences combining a neighborhood rich in history with a modern city lifestyle. These refined homes are an entertainer's dream with a Bowers & Wilkins surround sound stereo, designer chandeliers, 14' floor-to-ceiling windows, and private outdoor space! Embrace the vibrant Fenway area which is home to Fenway Park and the Boston Red Sox, renowned educational institutions, acclaimed venues of the arts, plus shopping and dining destinations. Residents have access to 24-hour concierge, two rooftop terraces, a complimentary fitness center and intimate lounges designed by MARKZEFF.